Living in the digital age means inhabiting a time where we are increasingly able to achieve what was previously unimaginable. This era has touched every aspect of life, and fiber art is no exception. From artists designing their work via software to the benefits of digitally printing textiles, Fiber Arts in the Digital Age explores various fiber-based works that only exist due to modern technology. Each artist in the exhibition has contributed at least three works from a series to illuminate how working digitally enables them to expand on an idea, design, or pattern. Fiber Arts in the Digital Age is curated by the museum and features fourteen artists from throughout the U.S. and one from the U.K. The artists include Jill Ault, Anna Chupa, Carolyn Crump, Jayne Bentley Gaskins, Meredith Re’ Grimsley, Deborah Fell, Michael James, Patricia Kennedy-Zafred, Gay Lasher, Susie Monday, Olga Norris, Becka Rahn, Wen Redmond, Vicki Reed, and Charlotte Ziebarth. This exhibit is sponsored by Susan Graham Wernecke and Bill Wernecke Jr. This traveling international exhibit features highlights from the acclaimed 2015 international quilt competition. This biennial exhibition is the largest international quilting contest in Japan and one of the most prestigious in the world. It is sponsored by the Japanese Handicraft Instructors Association, a group promoting handcrafted arts in Japan for over 40 years. Winning quilts from their traveling exhibit were first presented at the Tokyo Metropolitan Art Museum. The exhibit is split into two categories, "Traditional" and "Contemporary." WMQFA will be hosting a sampling of both. The Wisconsin Museum of Quilts & Fiber Arts (WMQFA) is proud to be the first to host a new traveling exhibition dedicated to celebrating the life and art of Prince. Commemorating His Purple Reign: A Textural Tribute to Prince is produced and circulated by the Textile Center in Minneapolis, Minnesota. Prince not only left behind grieving fans across the globe, but also an impressive body of work and an inspiring legacy. This legacy inspired Dr. Carolyn Mazloomi to serve as both juror and curator to an art quilt exhibition honoring his memory. Traditional quilts featuring floral appliqué make up this charming spring themed exhibition with a focus on appliqué basics. The Wisconsin Museum of Quilts & Fiber Arts (WMQFA) is proud to present a new exhibition ex-clusively showcasing nine traditional quilts from the museum’s permanent collection. 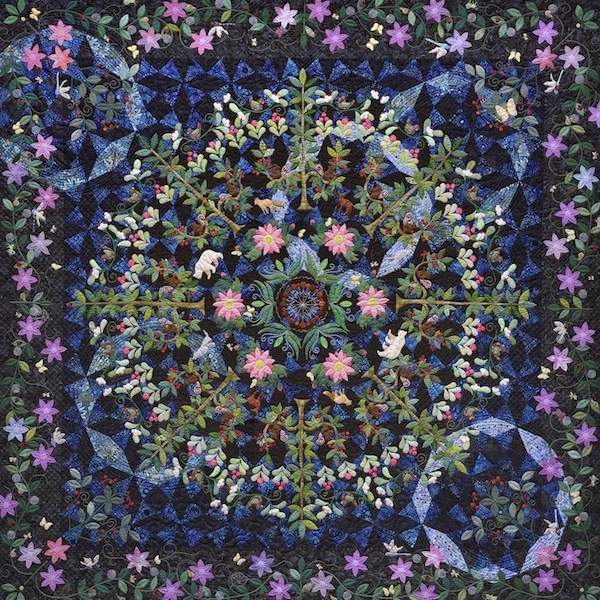 These quilts were selected because each highlights a different appliqué technique in a floral design. 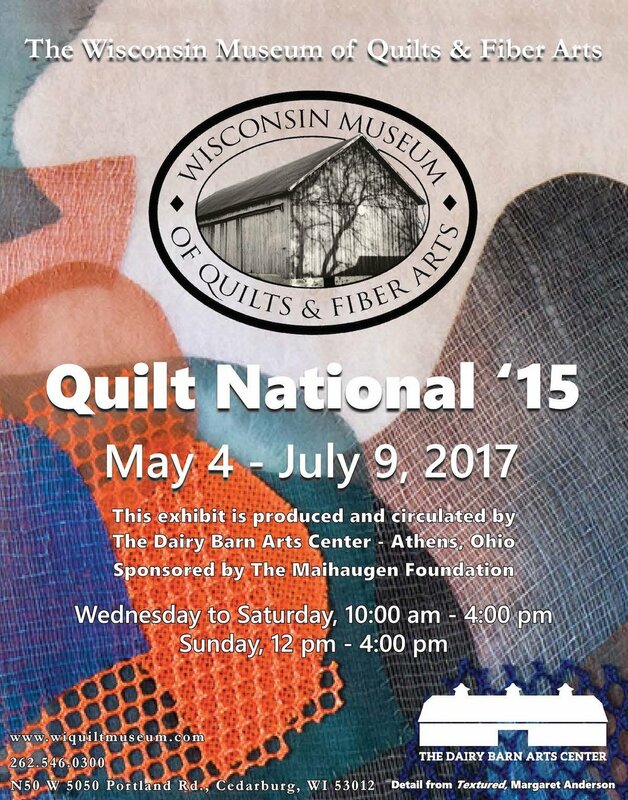 Quilt National ‘15 is the 19th biennial exhibition of jury selected original and innovative contemporary quilts produced by The Dairy Barn Arts Center. The quilts are the works of fiber artists representing 33 states and 8 different countries. The Wisconsin Museum of Quilts & Fiber Arts is proud to present a selection of 25 of the 84 quilts exclusively chosen to be part of this special exhibition. In Death channels human reactions to personal tragedy and mortality into fiber art. The Wisconsin Museum of Quilts & Fiber Arts is pleased to present a new group exhibition this summer. The bluntly titled exhibition, In Death, features over twenty contemporary fiber artists from across the United States. On view July 13—December 3, 2017, In Death lays bare the realities and mysteries associated with the end of life. The Wisconsin Museum of Quilts & Fiber Arts is very proud to announce it is the new custodian of a private collection consisting of hundreds of pieces of lace. A collection born of love, Lois Markus meticulously handpicked the pieces over the span of thirty years during her many travels between the United States and Europe. Markus writes, “I am so excited my beautiful lace might find a home where it can be admired.” The collection was donated to the museum in 2015, turning Markus’ hope into a reality. The Wisconsin Museum of Quilts & Fiber Arts (WMQFA) is proud to present a new exhibition exclusively showcasing Wisconsin artists. WMQFA is proud to continue its tradition of hosting a biennale for the sixth year running— a tradition almost as old as the institution itself. 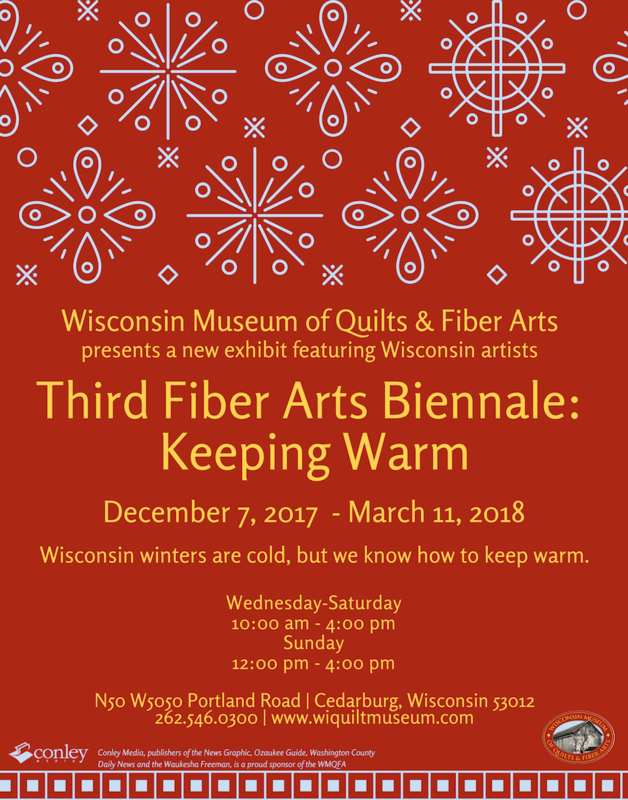 The theme of this years Fiber Arts Biennale is “Keeping Warm” as per its slogan “Wisconsin’s winters are cold, but we know how to keep warm.” This is a playful look at the way we deal with the long winter months is both a practical and a whimsical way. WMQFA is partnering with artist Patricia Sanabria-Friederich to bring an exhibition of Costa Rican fiber arts to the museum. Sanabria-Friederich, a native of Costa Rica, designs quilts inspired by the mosaic tiles found throughout Costa Rica. El Baúl de mi Abuelita translates to “My Grandmother’s Trunk” and is the name of her family’s quilt shop in Costa Rica. Sanabria-Friederich and her relatives are helping the museum identify traditional Costa Rican textiles that will be featured in the exhibition. These will include quilts made by Costa Rican quilters, Costa Rican ceremonial costumes, and dolls dressed in Costa Rican national dresses. WMQFA is pleased to show off two of the museum’s own Collections in this exhibition. The James A. Taylor Coverlet Collection consists of 35 woven coverlets from the 19th century. The Stevengraph Collection are silk, Jacquard-woven novelties from the 19th century. Both Collections are being exhibited for the first time. Quilt Nihon is an exhibition featuring stunning and award-winning Japanese quilts, in both traditional and contemporary styles, from Japan’s largest quilt show. The exhibition is a collaboration between the Japanese Handicraft Instructors’ Association of Tokyo, Japan; National Quilt Museum of Paducah, Kentucky; New England Quilt Museum of Lowell, MA; International Quilt Study Center and Museum of Lincoln, NE; and WMQFA. The four museums have partnered together to bring these amazing works of art to the United States. WMQFA will be the only place to see these stunning artworks in the upper Midwest. The Folk Art Costumes and Regalia exhibition is a collaborative effort with the Cedarburg Art Museum and Cedarburg Cultural Center. Each organization is focusing on a different aspect of folk art. WMQFA will focus on traditional ethnic folk art costumes and regalia. The Cedarburg Art Museum is looking regionally at the Cedarburg’s Christmas in the Country, celebrating the revival of folk art. The Cedarburg Cultural Center is looking at the future, inviting artists for a modern take on folk art. Caryl Bryer Fallert-Gentry Retrospective. Virginia Avery Wearable Art Collection. An exploration of embroidery and needle arts. Featuring Wisconsin artists from throughout the state. From creatures big to small, fiber artists have been inspired by animals of all kinds. Celebrating modern and contemporary quilters! Showcasing fiber art that explores grief, joy, hope, and healing. All of the artwork was created to benefit someone else in some way. Featuring two quilting pioneers: Mary McElwain and Victoria Findlay Wolfe. McElwain operated a small quilt shop in Walworth, Wisconsin, that became famous world-wide. She pioneered dye cut patterns and was a master promoter. Findlay Wolfe is a pioneer of modern and contemporary quilting. All things woolly and warm! Our staff and volunteers are here to help make your visit as enjoyable and educational as possible. Please contact us with any questions you may have.